This won't happen again, you mutter to yourself as you walk away from the range. It might have been raining a bit that day, or maybe the cold weather got to your bare skin. Either way you don't want to suffer the humiliation of missing multiple targets. What Are The Best Shooting Gloves When Using A Pistol? Living the dangerous lifestyle our officers do, or even the casual weekend warrior, is difficult in itself. But when it comes to protecting the source of most of your activity when shooting, your hands, this is an area you don't want to cut corners or you might be a few degrees off..In this article we're going to go through the 4 best shooting gloves for pistols that we've found to fit the needs of an active weekend warrior shooter or law enforcement lifestyle. What Makes A Great Tactical/Shooting Glove? When picking out the best shooting gloves for a pistol there are some things to consider more than picking out a generic pair of shooting gloves. You don't want to fat finger a shot off when you reach for your gun, right? That's why when you're picking out the right glove for you you want to make sure it's a pretty snug fit throughout your hand. You don't want your hand to slide around in the glove more than necessary. On the other hand, pun intended, you don't want a latex fit as that would take away from the weather protection. Is it an all weather glove? Some gloves are strictly for grip and have little to no weatherproofing, so make sure you look at all the features of the glove to make sure it fits YOUR situation before picking out a generic one. What's the caliber of your pistol? Don't get suckered into thinking that if you need a glove to handle the recoil of your gun that you're a weenie. Anyone who's ever shot anything more than a gloc knows that after a clip or two that gun beats your hands up. If you're looking for the best of the best in all around warmth and protection, then the FREETO Mens Tactical Gloves are a home run for sure! And with multiple layers of synthetic and durable materials, this glove will keep you warm as you go through the toughest of shooting experiences. 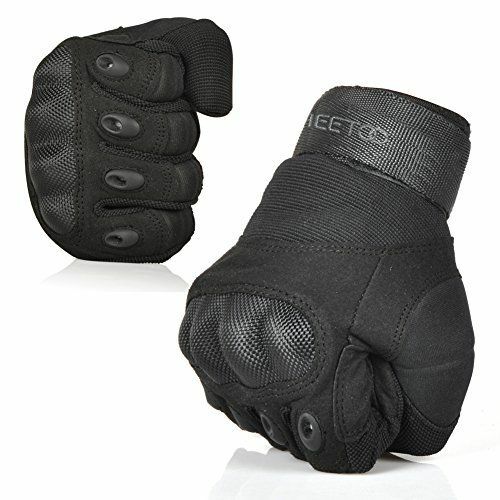 From punching pavement to punching thugs this glove will take a beating and give it right back to the would be assailant! The price might be a bit high for these gloves, especially since they run small. So if you don't know that they run small you could waste time (more money) trying to find the right size. So make sure you know you're size and how to order them. These gloves are meant to handle anything from wear and tear on sharp or jagged surfaces, all the way to being flame retardant and water proof. These gloves are battle tested and will give you everything you could possibly need in a shooting glove. Mechanix tactical gear was designed with the military in mind, so you can bet that anything they release to civilians is going to be top notch! First of all the index finger impact guard is one of the best features about this glove.​ Because it's separate from the rest of the knuckles, the index finger moves freely, allowing easier access to the trigger guard without sacrificing protection. Also the thermal plastic rubber on the back of the glove will keep your hands safe from those empty shells coming out! The palm padding on these gloves were designed to withstand M4 fire with limited hand fatigue after 3 consecutive clips. So you're certainly not going to walk away from the range shaking your wrist out after firing your pistol with one of these things on. As a shooter or law enforcer you're going to need to have a pair of gloves that can keep your hands warm even when they're clutched on the cold steel of your pistol. There would be no worse feeling than having that worst situation in your sites that means life or death for a family, and missing because your hands were shaking due to the cold. The Specialist Neoprene Glove is our most popular duty glove. Designed specifically for all-weather gun use, this glove is an essential piece of equipment for all men and women of Law Enforcement and wild game hunters. The palm is made of Synsi-feel™ synthetic leather, which provides excellent grip and accurate feel. For maximum grip, Toughtek™ non-slip patches are sewn onto the palm and all fingertips except the index finger, to facilitate the best possible trigger control. A Velcro® closure keeps it comfortably and firmly in place. The Specialist Neoprene Glove feels like a second skin, with unmatched flexibility, dexterity and grip.